Coke has cracked a brilliant brand idea in 'Open Happiness', an idea that is inspiring its marketing teams across the globe to come out with endearing ads and activations. 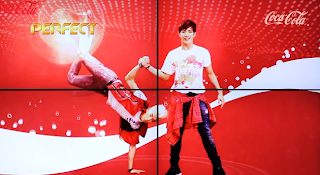 The latest success is from Korea in the form of a vending machine that rewards people for expressing their happiness by dancing in front of it. This vending machine uses the Xbox Kinect technology (sensors and webcams) that recognises human interaction and rewards the right moves. A similar idea was implemented by Coke in Istanbull when they installed a vending machine that rewarded couples with a bottle of happiness if they showed some love in front of the machine. Here the technology was a lot more simpler as the bottle flow was manually controlled. Coke's surprises students across college canteens in the United States through this vending machine. 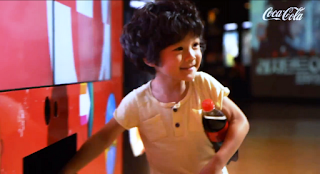 Coca Cola, Peru, cracks the amazing idea of 'Wallet of happiness' that brings a smile to everyone who watches this video. It restores our faith in humanity and provides an occasion to celebrate (and consume Coke). The idea behind this campaign is so universal that it drew amazing marketing success in every country it was executed. Next is a soulfull execution by Coca Cola, Phillipines, in bringing home happiness, literally. This ad by Coca Cola, India, brings a moment of cheer to peoples homes. The 'Happiness Truck' strikes unsuspecting people in Honduras, Russsia, Brazil and India with surprises and Coke. Coca-Cola introduced another concept similar to the Happiness truck in roll-out park. This iconic Coke bottle shaped park strives to make skyscraper cities a little less gray. It invites passersby to take off their shoes and take a moment to enjoy the the grassy scenery with a bottle of Coke. In the following video Coca-Cola adds a little bit of summer fun into the bustling Amsterdam. The following execution from Coke is my favourite one. It shows that what unites us is stronger than what sets us apart. High-tech vending machines installed in two popular shopping malls in Lahore, Pakistan and New Delhi, India – two cities separated by only 325 miles, but seemingly worlds apart due to decades of political tension – invited consumers to put their differences aside and share a simple moment over a Coke. So will you dance for a bottle of Coke or to experience the happiness of swaying to life's rhythms? Or is happiness now about opening a bottle of Coke?